There were dozens of announcements for its biggest titles. This post is in partnership with Hi-Rez. After Hi-Rez Studios announced that its annual Hi-Rez Expo would be held in correspondence with DreamHack Atlanta, fans were ready for a weekend filled with competition. The company hosted three separate tournaments for its biggest games—SMITE, Paladins, and Realm Royale. Each of these events had several layers of competition and saw a few big announcements for the respective franchises. During the 2019 SMITE World Championship, eight teams battled it out to claim their share of $1 million. The finals came down to Splyce and Team RivaL, both of which came into the final series undefeated. Each team dominated their respective brackets, emerging with a perfect 5-0 record that would be tested immediately. RivaL came in looking unfettered by their initial seeding in the event and proceeded to dominate the first game in the best-of-five series. It was a standout 26-8 kill differential that highlighted the game one dominance. The gap in performance was quickly closed in the second game as Splyce squeezed out a win to even the series up 1-1. By the end of game two, the North American squad looked to have RivaL’s number pegged with a solid second win. Down 2-1, RivaL almost looked dead to rights when Splyce came out firing early in game four. It took half the match, but eventually, the underdogs clawed their way out of the deficit and started building a lead. Splyce managed to keep it close after the shocking turn around, but it wasn’t enough to clinch their win. The deciding match was an intense brawl that Splyce controlled from start to finish. There was no letup for RivaL as they were rushed by an aggressive opponent. Splyce was crowned the 2019 Smite Champions after their 3-2 victory. At the same time, the 2019 Paladins Championship was well underway. It was an intense tournament that saw a final battle between returning champion Natus Vincere and Team Envy. 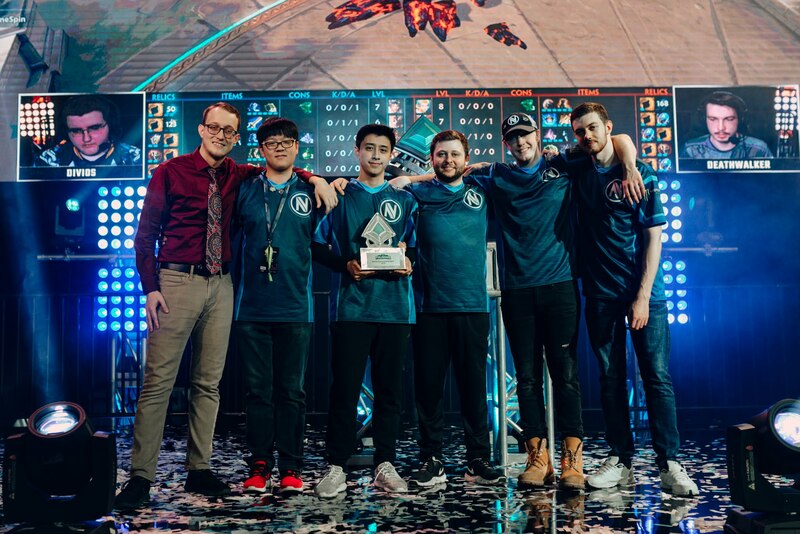 It was a long tug-of-war between the two powerhouses, but after an impressive opening from Na’Vi, Envy rode a wave of momentum all the way to a 4-2 victory and the championship. The last major event was the Realm Royale Founder’s Tournament—an event that allowed anyone to compete for their chance at $25,000. After two days of qualifying events, the final series had one pair that dominated the entire competition. Congratulations to the @WatchMixer #HRX $25,000 Founder’s Tournament winners @ausrhino_ and @Yung_Kronicx! After multiple match victories, they have claimed the Crown Royale! The duo of Kronicx and ausrhinom=, two pro Paladins players for Kanga Esports, had no equal through the concluding battles. Their final score of -78 was more than three times that of the second place finishers. During each of the events, Hi-Rez played videos that gave players a look at what is to come for their favorite games. The biggest announcement being the overall plan to bring games to new consoles with cross-platform capabilities, starting with its flagship game, SMITE. The game will be coming to Nintendo Switch in 2019. Early access for the console will launch Jan. 24 and the Founder’s Pack is available for pre-order now. Realm Royale will be giving out more keys for the closed beta on Xbox One, and PS4 closed beta will launch in the near future. Both of SMITE and Realm Royale, along with Paladins, will also enable crossplay between PC and Xbox—with the addition of Switch for SMITE and Paladins soon. Along with those announcements, several other key details were given about upcoming content across those titles. Realm Royale is adding more creatures to its expansive overworld that players can interact with to gain loot. These Loot Goblins are the first of their kind, but they won’t be the last. As the development ramps up on the class-based battle royale, the development team has rebranded into Heroic Leap, although a reason for the rebrand was not given. The Paladins devs also saw a rebrand into Evil Mojo. This rebrand comes at a time where the game is looking to focus on its multiplayer and the story that surrounds it. This story led to the announcement of a new champion, Imani, before the devs started talking about what else is to come. One of those announcements being that along with Imani, five other heroes and six maps would be added to the game in the coming year. Players will have a chance to play the 2.01 update for the game, which severely changes up how the meta works, starting on the PTS on Dec. 17 before it officially launches sometime in January. The team also announced that major updates will now be a monthly occurrence. Clans, in-game tournaments, and the ability to commend players following the conclusion of a match are also features that will be coming soon to the free-to-play experience. Lastly, SMITE dropped some big news, including the introduction to the 99th and 100th Gods for the game. King Arthur and Merlin are the next gods to join the fray starting in 2019. This news was the follow-up to a new story trailer that teased some big changes happening in the world of SMITE. The king and magician were not the only characters teased. Jörmungandr, the World Serpent from Norse Mythology, will also be joining the battle alongside Horus and Set from Egyptian lore. The team also gave fans a small peek into those that will follow after the initial five gods, but nothing concrete like a name. Aside from character and story beats, roll queue for Conquest and a reworked Arena were hit on too. The new arena is available for players to use right now, with roll queue coming soon. To end the announcements, Hi-Rez told fans that pro-league matches—including regular season ones—will now all be played in person via LAN in Atlanta, GA. Several teams will move to the area while others will fly in to compete. This change allows for higher quality broadcasts in controlled environments. Something that is sure to increase the overall quality for those watching live or at home.